GRISCY brings together three anti-Turkish states along Ankara’s Western and Southern peripheries and gives them a sense of integrational purpose through the Eastern Mediterranean Gas Pipeline that they’re all involved in, which in turn serves as the physical basis for expanding their energy relations to the political, military, and ultimately strategic levels. Greece fulfills an especially important role in this alliance because of Turkey’s transit dependence on it for connecting the Azerbaijani-originating TANAP gas pipeline to Southern Europe, which interestingly puts Ankara in the position of possibly being blackmailed by Athens (either on Greece’s own initiative of at the urging of one of its partners) just like Moscow was by Kiev in the early 2000s. Another point of pertinence in relation to Greece is that it aspires to become a regional leader in the interconnected Balkan-Eastern Mediterranean space not only through its energy connectivity potential but also because of the role that it’s played in the Republic of Macedonia (now “recognized” as the so-called “Republic of North Macedonia”) and Cyprus. While Macedonia isn’t of strategic relevance for Turkey, Cyprus certainly is due to the unresolved issue over the northern part of the island, which is why the resumption of American arms shipments to Nicosia could be very troubling for Ankara and must therefore be seen as “punishment” for its purchase of the S-400s and failure to cooperate with Washington in Syria to the extent that the Pentagon wants. It goes without saying that Greece and Cyprus are also very economically destitute countries whose governments can easily be bought by the US and “Israel”, and with both of their populations being anti-Turkish to the bone, these countries’ alliances with those two aforementioned powers will probably be overlooked by many or even praised because of Washington and Tel Aviv’s antipathy to Ankara nowadays. There’s even a credible chance that its many supporters at home and abroad will present GRISCY’s role as the US’ “Lead From Behind” proxy for managing Eastern Mediterranean affairs through the prism of the so-called “Clash of Civilizations” by portraying it as the West’s “frontline defense” for “protecting Judeo-Christian civilization” from Islam, which could wildly increase its appeal among many right-wing individuals. Not only would GRISCY contain Turkey, however, but Ekathimerini’s last-mentioned detail about the proposed Act specifically indicates that it has an anti-Russian purpose as well, one that could very easily be expanded throughout the entire Eastern Mediterranean region as recently proven by Pompeo’s threat to sanction Egypt if it proceeds with its planned large-scale purchase of Russian warplanes. 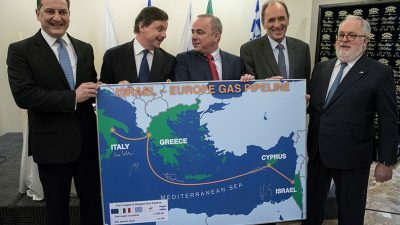 More specifically to the alliance’s three members, the US could try to thwart TurkStream’s possible expansion to Greece en route to Italy, continue cracking down on oligarchic holdings in Cyprus, and try to weaken the Russian-“Israeli” Strategic Partnership, as well as potentially cut off Moscow’s “Levantine Line” trade route between Crimea, Syria, the Sinai, and Eritrea in the event of a crisis. Concerning China, Beijing’s control over the Greek port of Piraeus provides the People’s Republic with a reliable entry point to the Polish-led “Three Seas Initiative”and is the basis for its Balkan Silk Road, so it’s in the US’ interests to monitor all activity related to this important node in the Belt & Road Initiative (BRI) and to also keep tabs on Chinese activity in the strategic “Israeli” port of Haifa, too. As argued in this analysis, all of the above-mentioned points clearly prove that the US’ “Eastern Mediterranean Security and Energy Partnership Act” is intended to contain multipolarity in the Eastern Mediterranean by strengthening America’s strategic ties with its “Lead From Behind” proxy of GRISCY in order to thwart Turkish, Russian, and even Chinese designs in the region.